The Trail of Waitangi - Extracts from 'History of the Church Missionary' and 'Christianity Among The New Zealanders'. The Trail of Waitangi - on early New Zealand History. Very good reading. There are three sections here, the first begining at a time some 20 years before any established and welcome mission came to New Zealand, mentions some of the earlier Maori that visited overseas in pre-missionary times. It covers the genuineness of the Treaty, and then turmoil caused by the intention to 'change the rules', Maori 'movements' and touches on the wars. Part 1 from Vol 1. 1786. 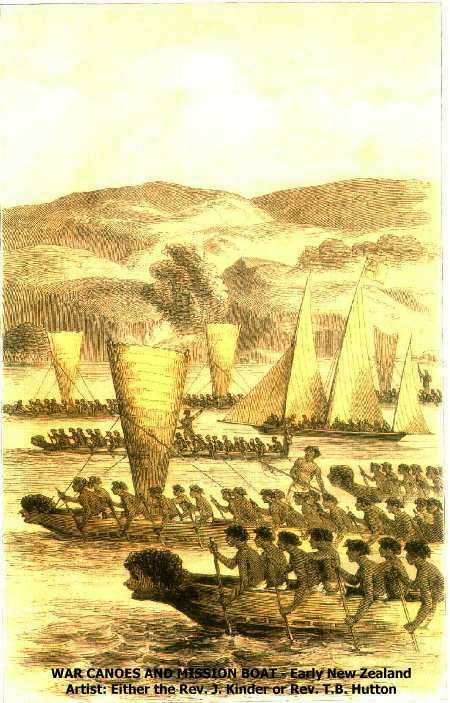 Samuel Marsden - his opposition from authority and traders - meeting first Maori. Civilization or Gospel? Ruatara, Hongi, Samuel Lee, Henry and William Williams, etc. Part 2 from Vol 1. Advent of Colonists - Annexation of New Zealand - Bishop Selwyn, his travels and trials - Treaty - Colonial Encroachment and Maori Discontent - Governors Fitzroy and Grey - The Missionary Lands Question - Grey's Secret Despatch - The Maori Bible. By the Right Rev. William Williams, D.C.L. Bishop of Waiapu. SEELEY, JACKSON, AND HALLIDAY, 54 FLEET STREET, LONDON MDCCCLXVII.